In Luke 6:46, Jesus asks a rather provocative question. Here’s the crux of the issue. Must Jesus be your Savior AND Lord for you to be saved? OR can he be your Savior now and then at some later time you can commit yourself to his Lordship? Those who argue in favor of Lordship Salvation—that is, in the necessity of confessing Jesus as Savior AND Lord—they argue that not to do so is to invite people who unrepentantly practice sin to think that they have the assurance of salvation when, in point of fact, they shouldn’t have any assurance of salvation. 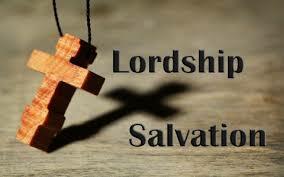 On the other hand, those who are against Lordship Salvation—that is, that Jesus can be your Savior first and then at some later time, he can become your Lord—well, they argue that Lordship Salvation is adding “works” to salvation. They say that we’re saved by grace alone and through faith alone. We should agree that we’re saved by grace alone and through faith alone, but we should also agree with James, that we’re saved by a faith that doesn’t remain alone. We’re saved by a faith that produces good works. That means Christ must be our Savior AND Lord. It’s what the scriptures demand. In Acts 16, the Philippian jailer asks Paul and Silas what he has to do to be saved. Here’s their response. Now, there’s an evangelistic moment that’s hard to miss. You have someone coming up to you and asking you what he needs to do to be saved. And notice what they tell him, “Believe in Jesus and you’ll be saved.” Right? Is that what they say—“believe in Jesus and you’ll be saved”? No, that’s not what they said. They tell the jailer, “Believe in the LORD Jesus and you will be saved.” It’s not enough to simply believe in Jesus—in a Jesus of your own making—but we need believe in who Jesus is. He’s the Lord Jesus. No other Jesus can save you. Only the Lord Jesus can save you. Here’s another scripture. This one is from Paul’s letter to the church in Rome. Just to state the obvious. Did you see what we need confess in order to be saved? We need to confess Jesus IS LORD. If you want to be saved, you need to confess that Jesus is Lord. Now, making that confession doesn’t mean that from that moment on, that you’re going to live your life in perfect obedience to Jesus. No, that’s not what it means. As long as we walk on this earth, we will be going through a process called sanctification. We’ll be learning every day what it means to follow Christ in obedience. Some days we’ll do a really good job, and other days, we’ll do a lousy job. But confessing Jesus as Lord means that we recognize that we’re not in charge of our lives any more. It means that we recognize that Jesus is in charge of our lives. He is our Lord. By virtue of what he did on the cross—through his death, burial, and resurrection—by virtue of who he is—he is God in the flesh—by virtue of what he’s done and by virtue of who he is, we confess him as our Lord and we seek to live our lives in obedience to him. Will there be times in my life when we stubbornly refuse to do what Jesus has told us to do. Yes, there will be those times. In the ongoing work of our sanctification—that is, in the ongoing work of God conforming us into the image of his Son Jesus—in that ongoing work there will be times when we will stubbornly give into sin and there will be times when we achieve victory over sin in our lives. And then after asking that question, Jesus tells a story in verses 47–49 to bring the point home. Allow me to paraphrase. There are two people. One person comes to Jesus and confesses him as Lord and actually does what Jesus tells him to do. Jesus tells us that he is like a house that has a strong, firm foundation of rock. When the storms of this life come, he won’t be shaken because his foundation is Jesus. The other guy is someone who confesses Jesus as Lord—that is, he says the right things—but he doesn’t actually do what Jesus tells him to do. This guy, when he builds his house, his house doesn’t have a foundation. When the storms of life come against his house, there’s going to be a great disaster. This house is going to crash and Jesus says, “the ruin of that house was great” (6:49b). So, now we should ask ourselves these questions. In which house do we live? Which house represents our life? Is our life characterized by doing what Jesus has told us to do through his Word or is our life characterized by a lack of obedience to God and his word? We’re not suggesting that anybody’s perfect, but is our life characterized by a desire to do what Jesus has commanded us to do? Is our house built on a firm foundation? Practically speaking, is Jesus our Lord?